The data link layer focuses on getting data reliably across any particular kind of link. Flow control and error notifications are also functions of the data link layer. The data link layer applies to all access methods, whether they are LAN or WAN methods. Information being processed at this layer is commonly known as frames. 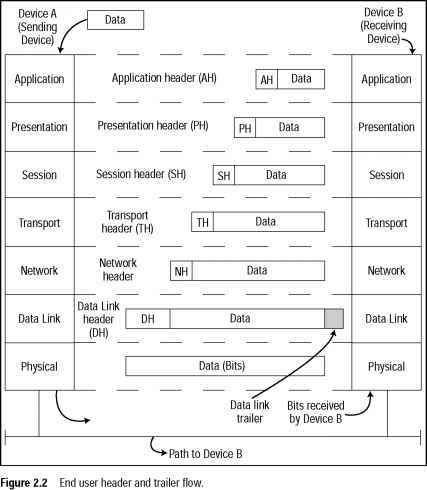 The IEEE further complicated matters by subdividing the data link layer into to sublayers: the Logical Link Control (LLC) sublayer and the MAC sublayer. Figure 2-1 displays the IEEE definition compared to the ISO definition. The LLC sublayer manages and ensures communication between end devices, and the Mac sublayer manages protocol access to the physical layer.